Using Straightforward in its original format? Don’t panic! The resources on this site will still support Straightforward Original Edition. We’ve transfered the majority of the original eBag resources over onto this site but pulled them out into their separate components so they are easier to navigate and search. The old familiars such as the worksheets, dictation activities and placement tests are still there and can be used with both editions. You can find also still access the Original Edition Companions to download. What’s different and why upgrade? Up-dated content – things change so fast these days and become obsolete so quickly that topics, articles and images have been up-dated to make sure your classroom is still relevant for today’s world. Up-dated components -Changes don’t just affect the outside world but the classroom as well. 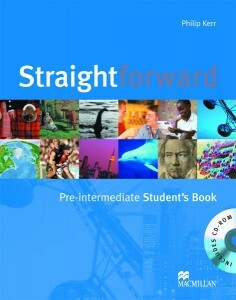 We’ve swapped the CD-ROM for an online resource – Straightforward Practice Online, taking the old activities and adding new ones to support the langauge and topics of the Student’s Book. What’s more is that you, as a teacher, can monitor your students’s progress online. Class Presentation – Are you finding you need to become more and more creative to keep your students engaged? The supporting Interactive Whiteboard material for Straightforward edition projects the Student’s Book onto the big screen and embeds all the audio, video, answers and a whole host of games to add some real heads-up learning for your students. Authentic Video – We’ve added in video from the BBC and ITN to give your students relevant, interesting and real language practice – accessible online, through the Teacher’s Book and on the Interactive Whiteboard material. CEF – we have strengthened the links with the Common European Framework and you’ll notice clearer signposting and self-checking. You can find out more about the features of the Second Edition in the Overview and Series Walkthrough sections.